The bright greenish yellow blooms are more intense than other strains and act as a good foil to hotter colours. It is understandably popular with flower arrangers and gives a splendid garden display. 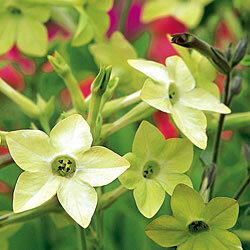 See photos of plants from the <a href="/genus/Nicotiana">Nicotiana</a> genus in real gardens.